Judges for the Bits to Its 3D Printing Sculpture show last year at the Landing Gallery in Rockland, Maine named RACHT from Belgian artist Nick Ervinck as Best in Show. Ping Fu, founder of Geomagic, American 3D Printing art pioneer Joshua Harker, and Math Art expert Dizingof gave the piece almost perfect scores for a hands-down win. And it was no wonder! The intricate design pushed the limits of 3D printing technology and clearly demonstrated the power of the process, both technically and aesthetically. At 11,000 Euros, however, the work of art was out of reach of most 3D Printing lovers. Now, you can have some of Nick’s beautiful work in photo form. He has just released a new book about his recent work with many photos, which of course in an art book are of high reproductive quality. The publication includes critical essays by leading European art experts: Prof. Neil Spiller (University of Greenwich), Dr. Julia Kelly (University of Hull) and Emeritus Prof. Freddy Decreus (Universiteit Gent). 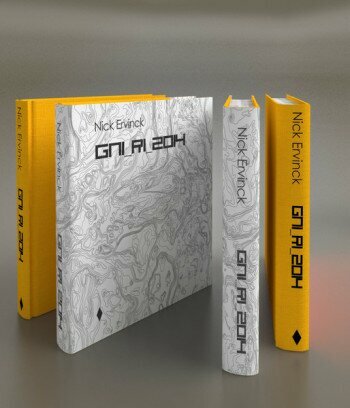 GNI_RI_2014 can be ordered on Nick’s website. Outside of Europe, buyers get a 6% discount [I’m assuming from VAT tax] so it’s $86.27 US or 67 Euros if in the EU. And the designs are amazing, even in 2D Form. I’m going to start saving up for a real Ervinck, but in the meantime his new book will feed my aesthetic soul!